As many know, Thomas Bruce, 7th Earl of Elgin, achieved permanent notoriety for removing the Parthenon sculptures in 1801-03 and bringing them to England. They were purchased by the British Museum in 1816 and have been known ever since as the Elgin Marbles. Elgin’s act was controversial at the time and remains so today. 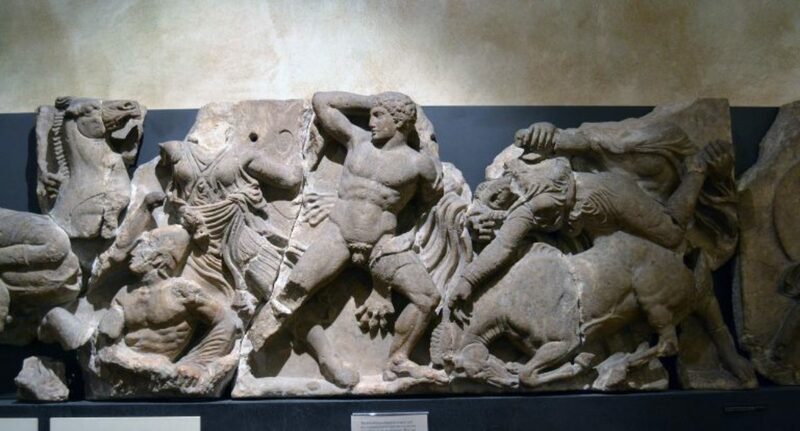 Their removal was questionable even though Elgin claimed he had received permission from the Turkish authorities, sparking discourse on the difference between retrieving vulnerable fragments lying about, and removing in situ elements from the Parthenon, such as its sculpted metopes. Nevertheless, the marbles have been preserved, viewed, and enjoyed by millions of visitors to the British Museum ever since. 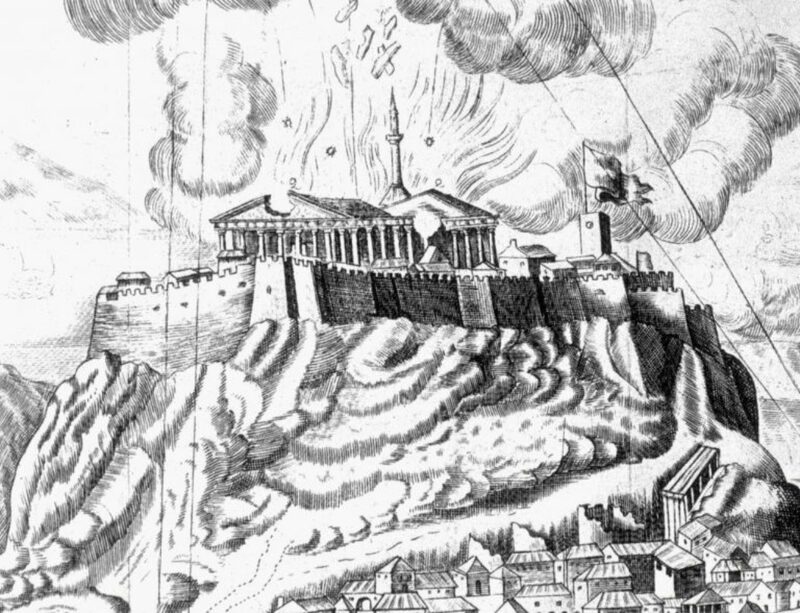 And we can be reasonably assured that many of the fragments Elgin obtained were spared being burnt by the locals for lime, particularly those that had been dislodged in 1687 when the Parthenon was blown apart by a Venetian artillery shell hitting the munitions then stored in the temple (Figure 1). 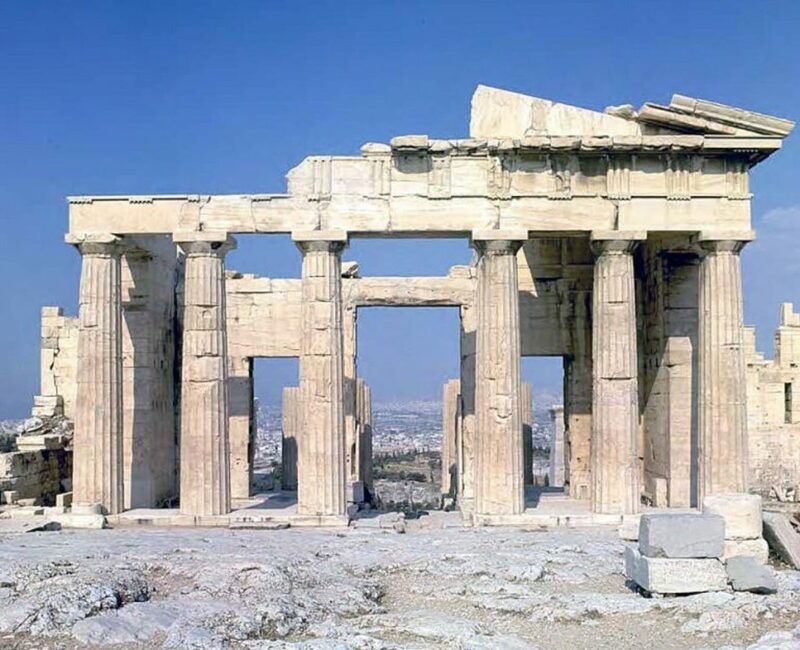 In addition to extracting the Parthenon sculptures, Elgin also helped himself to intact architectural artifacts, not only from the Parthenon but from other structures on the Acropolis and nearby. These and many other ancient architectural objects are also on display in the British Museum, where they receive much less attention than the Parthenon sculptures. The Parthenon’s famous sculptures are handsomely displayed in John Russell Pope’s regularly packed Duveen Gallery. 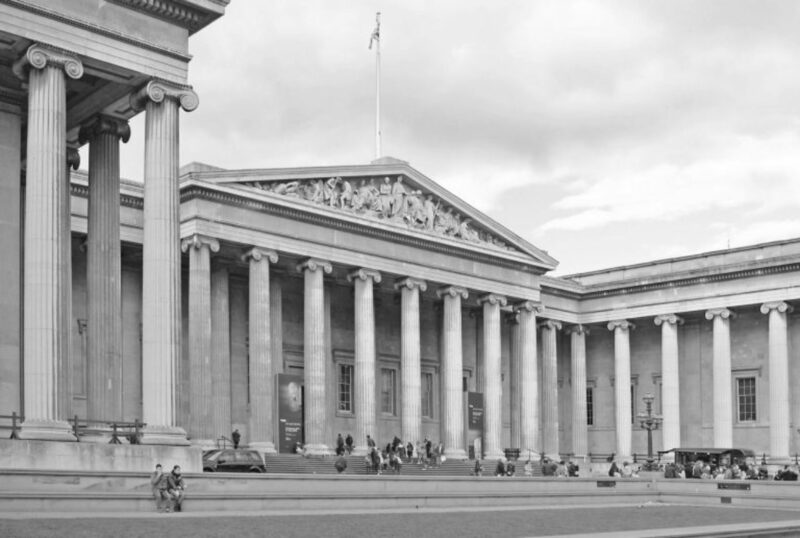 The architectural artifacts are scattered throughout the British Museum’s other galleries. Elgin was not the only individual to enrich the museum’s collection of Greek antiquities. Architectural fragments from other ancient sites are displayed along with Elgin’s. This Classical Comments essay deals with these precious relics, worthy of study and contemplation, if not veneration, by scholars, architectural historians, and architects. 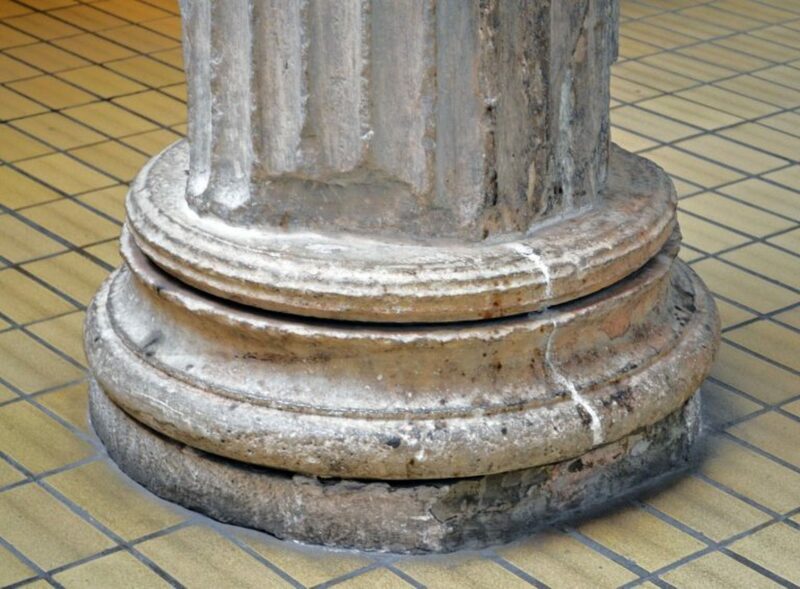 Among the largest and most conspicuous of Elgin’s architectural objects is a Doric capital and its shaft’s top drum, both originally part of the Parthenon’s peristyle (Figure 3). It’s uncertain whether Elgin’s team took these from an upright column or found them among items toppled over by the 1687 explosion. Even so, the capital offers close-up examination of its exquisitely subtle echinus and annulets (Figure 4). The fabricated section of the Parthenon’s entablature demonstrates the temple’s impressive scale. 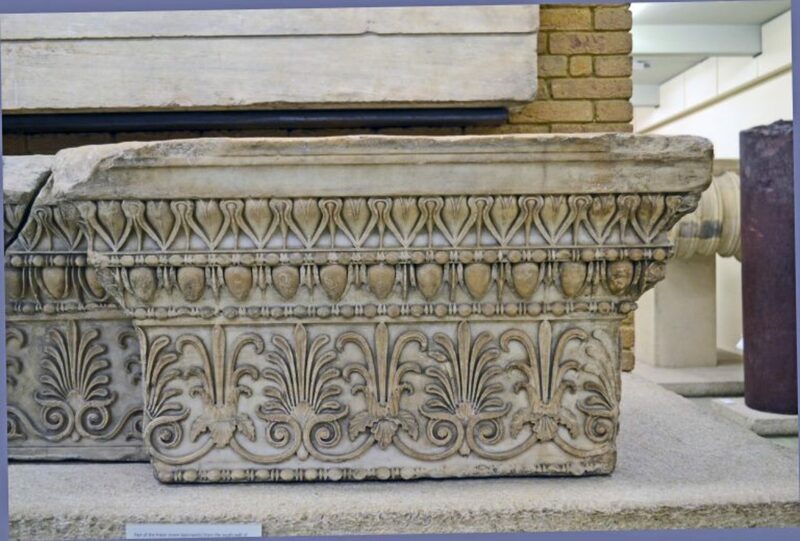 An additional capital from Elgin’s trove came from the Propylaea, the monumental columned structure forming the entrance to the Acropolis (Figure 5). 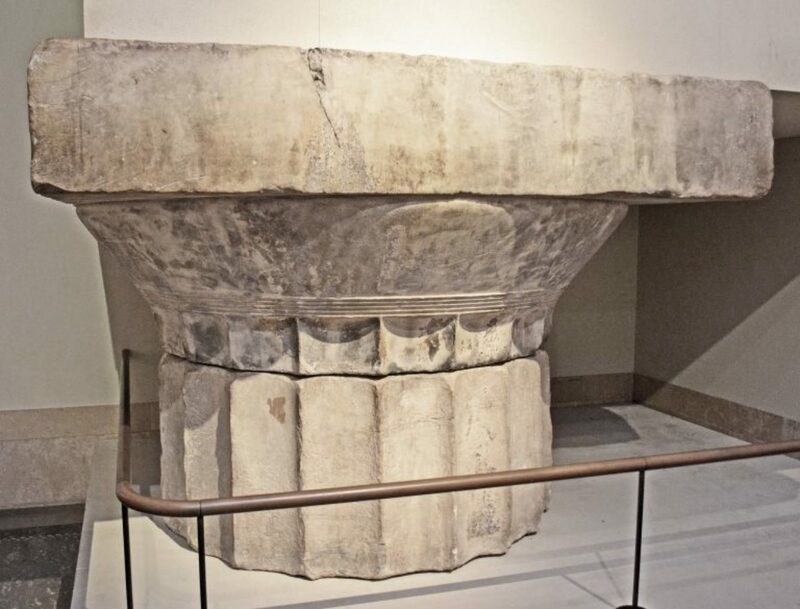 As with the Parthenon capital, it is difficult to know whether it was taken from an intact column or found on the ground; the latter is more likely since the Propylaea was severely damaged in 1656 by an explosion when the Turks were using the building as a powder magazine. The capital’s dark surface may be a vestige of the blast. The free-standing positioning of the capital permits detailed observation of the gentle flare of the fluting as it meets the annulets (Figure 6). The temple of Athena Nike, completed ca. 421 BC, stands perched on the edge of a high bastion adjacent to the Propylaea (Figure 7). The Turks dismantled it in 1686 in order to use its material to build the Acropolis fortifications. Many of its pieces were extracted following Greece’s independence from the Ottoman Turks in 1832. They were subsequently incorporated into an anastylosis reconstruction on the temple’s original site. The temple has since been rebuilt twice in order to correct structural deficiencies, the most recent rebuilding being completed in the past decade. Figure 7 shows its present incarnation. Elgin helped himself to one of the temple’s capitals during his Greek sojourn (Figure 8), never definitively disclosing how exactly he got it. Did he pull it from the fortifications or did he find it lying about? The damaged capital is now unceremoniously displayed on a shelf among other ancient architectural artifacts. The diagonally projecting stump of its missing volute indicates that it was one of the temple’s “two-sided” corner capitals. Lord Elgin took a particularly cavalier approach towards the Erechtheion, the complex Ionic temple next to the Parthenon (Figure 9). 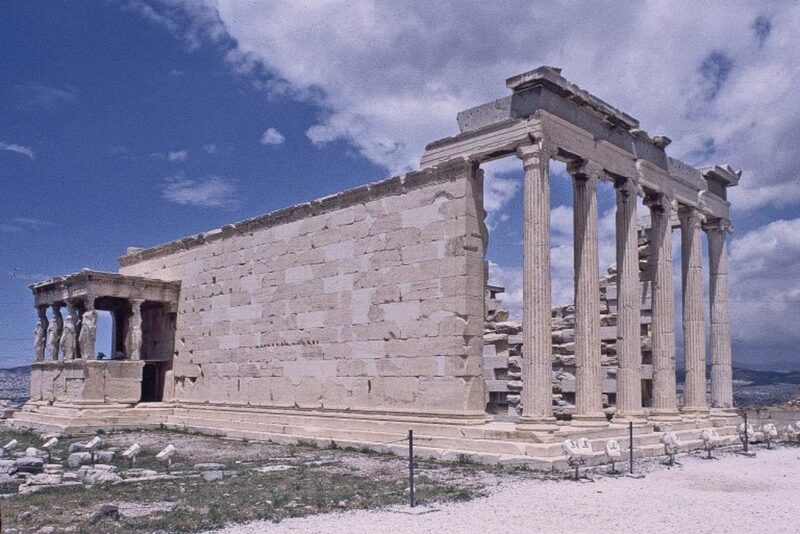 The Erechtheion lost most of its interior over the centuries, but, its basic exterior, save the roof, was intact when Elgin arrived on the scene in 1801. Few realize today that the right corner column of the Erechtheion’s east portico is a prosthesis. 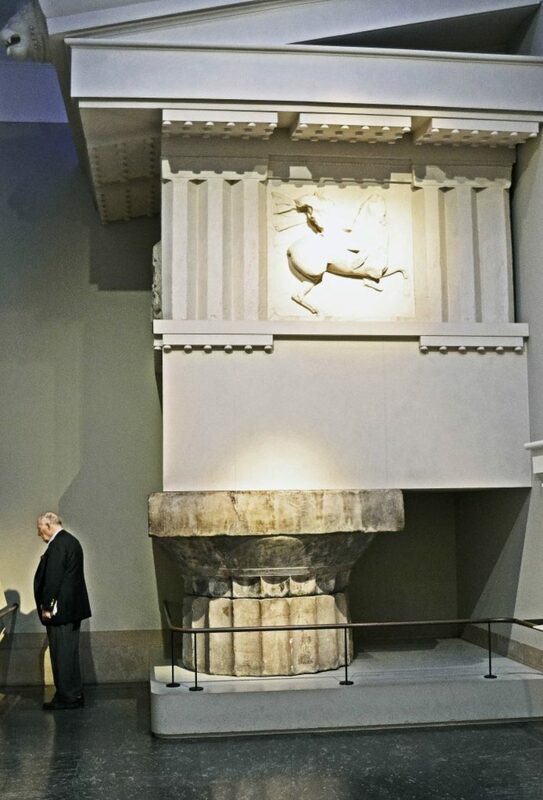 Elgin took the whole column to London, where it is now set up in the British Museum. 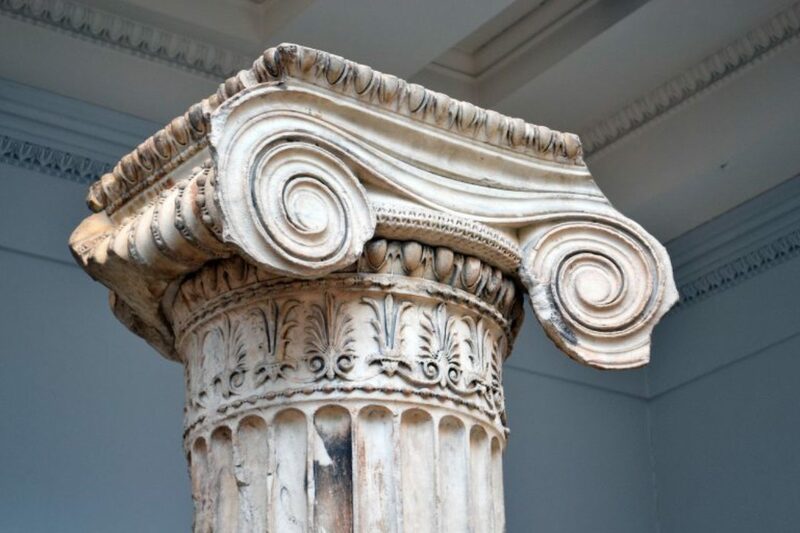 Its elegant capital is the richest, most complex version of the Greek Ionic order (Figure 10); it can easily be appreciated by viewing from a nearby upper-tier gallery. The column’s distinctive base is also accessible for close inspection (Figure 11). In a separate gallery, we find a section of the temple’s intricate anthemion frieze (Figure 12). 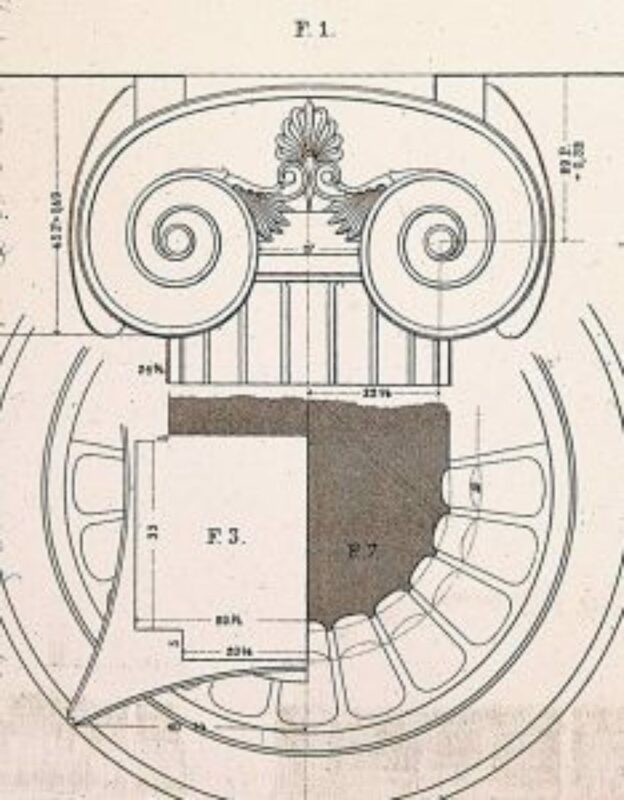 Elgin even helped himself to a length of the Erechtheion’s architrave with its subtle overlapping fascias (Figure 13). Not content with these pieces, Elgin focused his sights on the Erechtheion’s prize feature—the Caryatid porch, certainly one of the most famous porches in existence. There he removed the second from the left Caryatid and packed it off to Britain, where it decorated his country home until his collection was sold to the British Museum. The lady now stands by herself in the museum with only the Erechtheion’s column nearby to remind her of home. Elgin attempted to take another Caryatid by sawing it in pieces, but the sculpture fell and broke apart, so Elgin left it. It has since been restored. Elgin was not the only one to quarry Greece for architectural antiquities to the ultimate benefit of the British Museum. 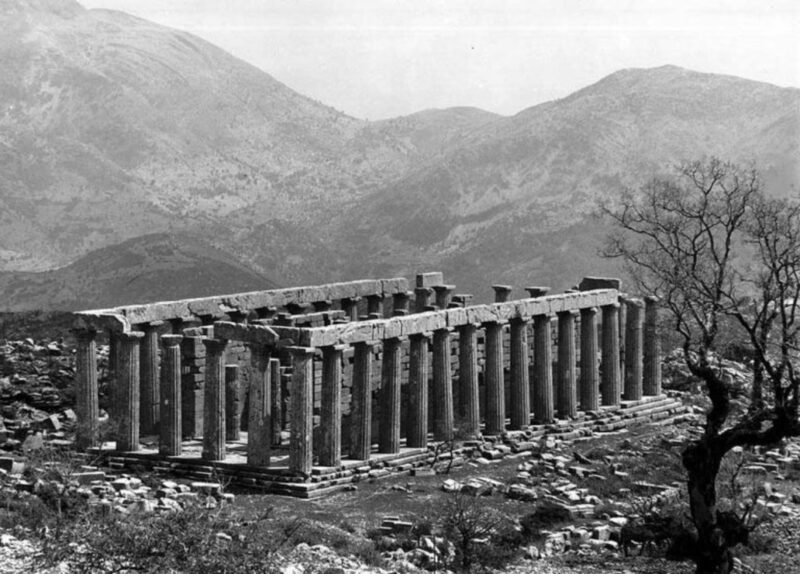 In 1811, the noted nineteenth century British architect Charles Cockerell was part of a team to make a study expedition to the Temple of Apollo Epicurius at Bassae, a remarkable work located high in the rugged mountains of Greece’s Peloponnese (Figure 15). 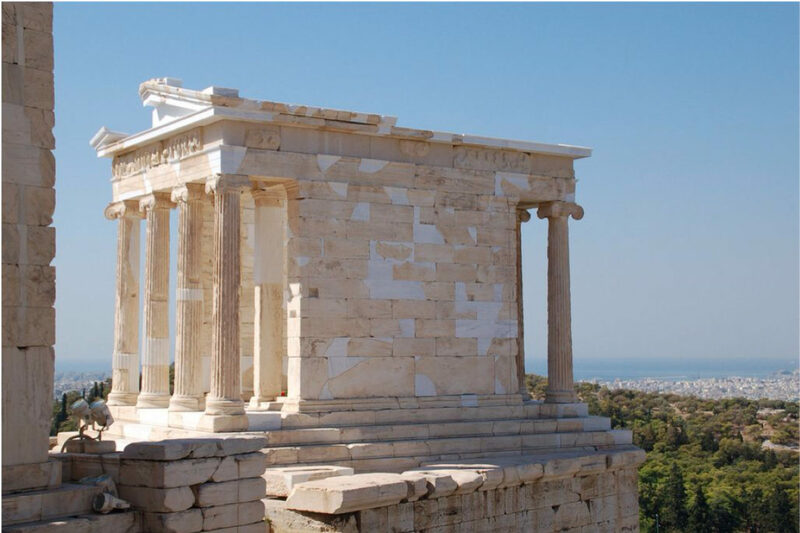 The temple’s design is ascribed to Ictinus, one of the architects of the Parthenon. It is known for being the only Greek temple to employ all three Greek architectural orders: Doric, Ionic, and Corinthian. We must credit Cockerell for producing detailed drawings of the temple. 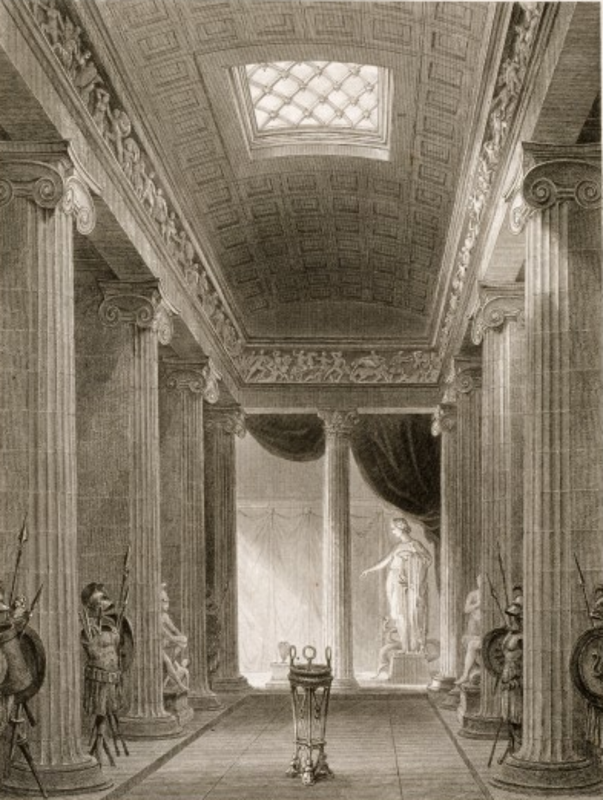 Shown here is an engraving of his restoration drawing of the cella with a single Corinthian column on axis and Ionic capitals topping masonry fins (Figure 16). But Cockerell’s expedition also attracted others’ attention to the temple. The next year, a group of British antiquaries set about extracting the temple’s sublime interior sculpted frieze, along with other objects. In 1815 the items were sold to the British Museum, where they have been on display ever since. A section of the frieze shown here depicts the Greeks’ mythological battle with the Amazons, a scene of intense vigor and violence (Figure 17). Among the small items retrieved from the temple was an antefix—a decorative termination of a roof tile (Figure 18). The object has unusually delicate relief carvings of stems and foliage, signaling the importance given to the temple’s every detail. 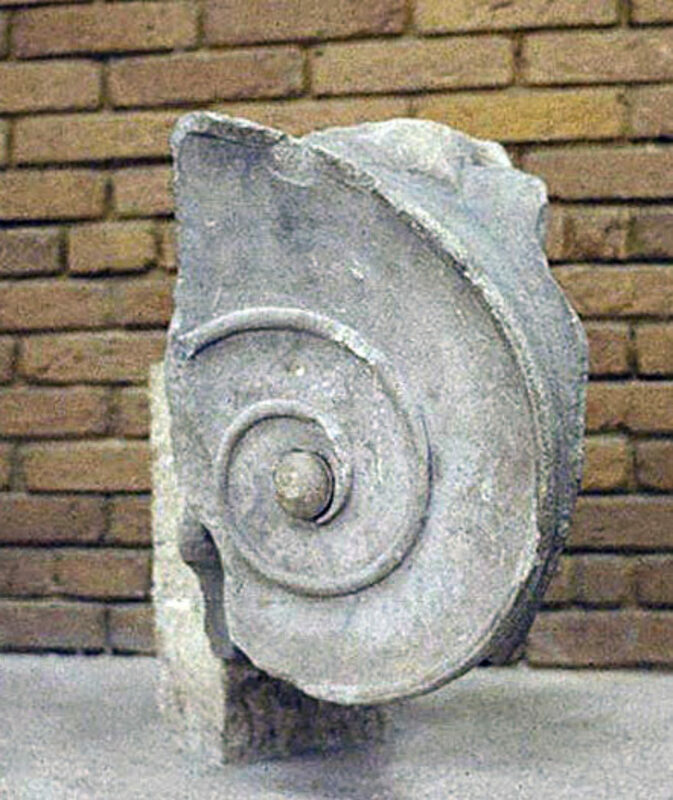 A very important salvaged artifact is a fragment of one the distinctive Ionic capitals that topped the cella fins (Figure 19). The capitals are unusual in that the volutes are connected by a continuous curve rather than being flattened under the abacus, as are nearly all other Ionic capitals. We see its design in Charles Normand’s restoration drawing (Figure 20). 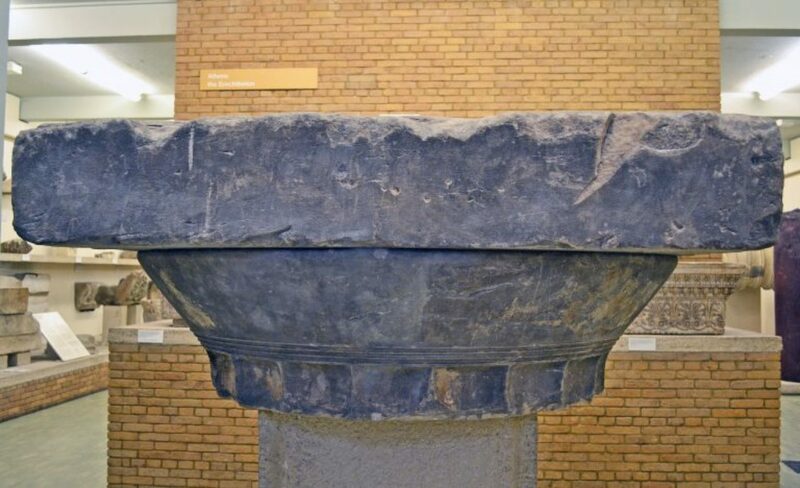 The museum’s fragment is one of the very few surviving pieces of the capitals. 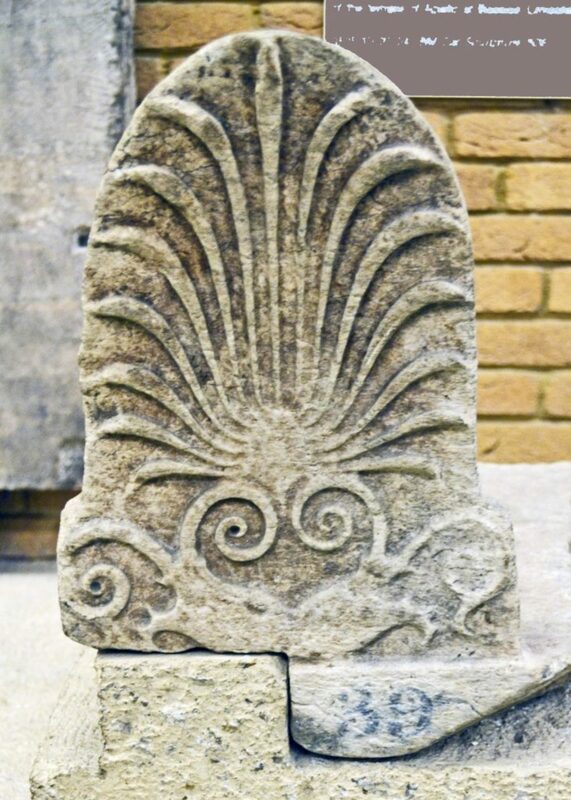 None of the capitals remained in situ when Cockerell visited the temple; they may have been shaken off by one of the earthquakes that often hit the region. 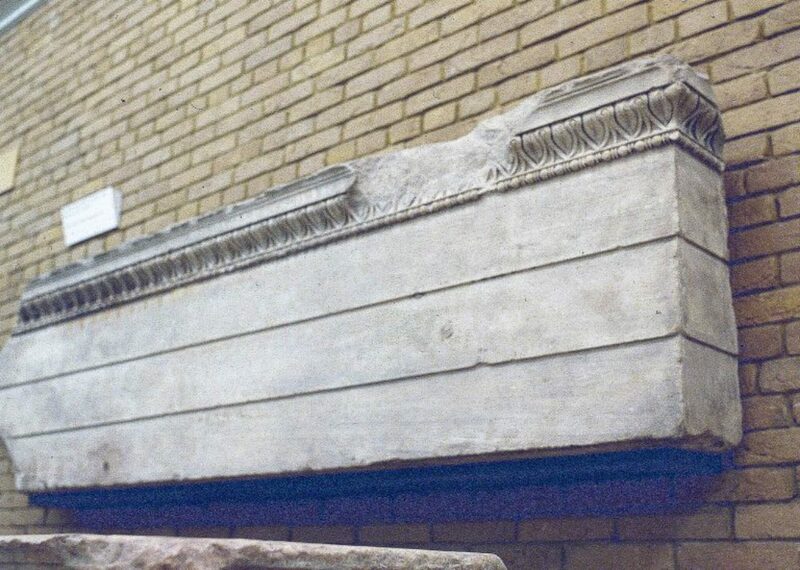 Nevertheless, the Bassae Ionic became popular for Neo-Grec buildings throughout Britain and the United States. Most famously, Cockerell employed the order for the portico and other columns on Oxford’s Ashmolean Museum. 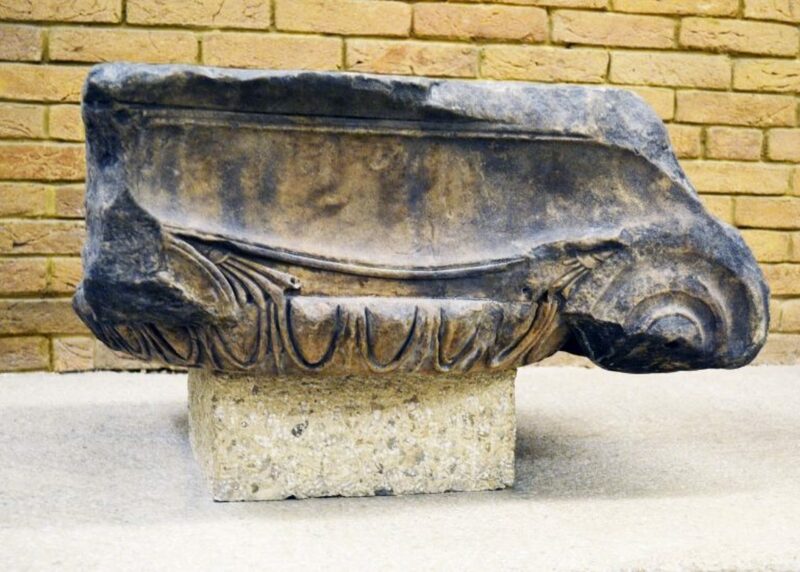 Whatever we might think about the appropriateness of these and many other architectural fragments being in the possession of the British Museum, the objects are remarkable relics of an ancient heritage that belongs to everyone. The museum has made these artifacts accessible for admiration and study for 200 years. Unless otherwise credited, all photographs are by the author.